Kids have a lot on their minds! Friends, their new shoes, their upcoming birthday, a sleep-over, and the butterfly that just flew by. Frequently, kids will not be in the right frame of mind to learn at practice. Some people call this "deliberate practice". Are there ideas for preparing kids to learn? When people are "ready to learn"-- they really want to learn for some reason-- then learning is much more effective. This evolving section is meant to include some ideas for mentally preparing kids so they get the most out of practice (with the team and on their own). Go see an older team play soccer (high school or professional)-- it may inspire players and open their eyes to what's possible. Capture the moment after or review a previous game or scrimmage-- especially a tie or loss where kids might be especially determined to get better at what was hard. Point out "if the other team can learn , then we can learn . Who wants to?". Ask kids what their goals are? Why are they playing soccer? Then refer to these goals. Have a team practice shirt(s). Some days may not be the day to learn something in a structured way. Moving on to scrimmaging may help as most kids always love to play the game-- and playing is learning. There are interesting coaching ideas in the "Double Goal Coach: Positive Coaching Tools for Honoring the Game and Developing Winners in Sports and Life"
Games are a time when you can demonstrate what you have already learned before the game started. Players who appreciate practice as much as games will improve faster. You could think of games like a test in school. How would you do on a math test if you did not spend any time preparing for it? And games can help you figure out what you need to work on next. Generally, if you don't win then the other team was doing one or more things more effectively than you. What were those things? Think​ about those things during and after the game and consider whether the categories and information below could help you and/or your team improve. Below are many easy-to-learn activities you can work on. You don't have to master them all, but try to master two or more and they will serve you well! Each has a 1-minute long video that demonstrate fast footwork skills you should learn. Watch a video first and then try it yourself. Really work at it for 10 or more minutes. As you get used to the basic pattern try to increase your speed. How fast can you go and still keep control of the ball? Your goal is to perform the skill at game speed. Spend 10 or more minutes practicing each day. Different players will like different skills-- but learn 2 or more for yourself. If you do, you will find you start to use these skills when you play to get out of trouble or trick other players. Show your coach each one you have learned! Teach them to a friend. "Rondo" Drills 1 - 10 VIDEO. Great sequence of possession games with variations to develop touch, vision, creativity, transition. Additional Video link 1 - The skills demonstrated in the video may look easy, but can you do what the kids are doing fluidly and easily yourself? If not, you should learn it! All but guaranteed, you will notice your ball control and confidence improves in practice and games. Try it, and practice it several times a week. Additional Video link 2 - A nice drill to practice alone or with teammates to get clear by cutting with inside/outside of your foot. Additional Video link 3 - more examples of kids "playing themselves clear" with other Coerver techniques. "Only the very best players will pass the ball immediately once or twice a game when they receive it. You have to learn to play yourself clear-- otherwise you will lose possession or will be forced to pass the ball on to a teammate who's in just as difficult a position. Or it becomes a kick and run soccer that depends on luck which is no good either. That's why basic ball handling techniques are so important." "A player has a lot of chances in the game to trick his opponent to move onto the wrong leg. That is why all young players should master the moves and enjoy the great feeling when the opponent is forced to move onto the wrong leg. They should use feinting as much as possible to help learn which move is most effective for them." "The few real stars on the soccer field today owe their success to being capable of the right action at the right moment-- usually with the result of beating 1,2 or 3 players. It is much more exciting for spectators and will bring more success to the team if players can beat opponents in dozens of different situations rather than just pass it on to other players who cannot beat their opponents either. 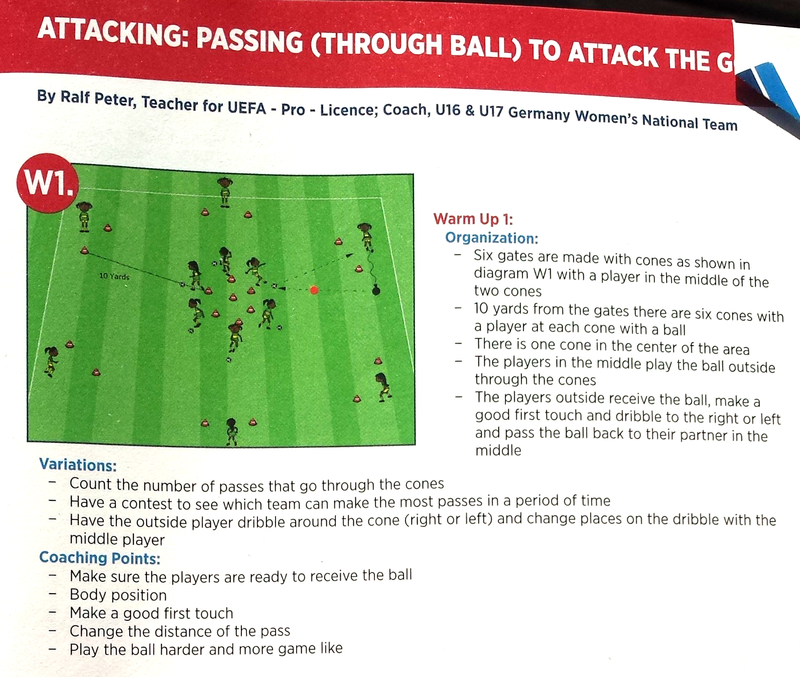 This can be very frustrating because it will frequently result in loss of ball possession when the objective of gaining control of the ball in the first place was to keep it, and eventually score a goal when the right opportunity is created." Activity. A GREAT twist on 1v1 keep away. Finding a way to apply the right amount of defensive pressure when learning to dribble / try new moves / etc. can be challenging-- typically the defense has the advantage. Here's a simple activity to try that is fun and works well! Setup: players pair up. One tries to shield ball from the other and keep possession by dribbling, changing directions, feinting, and misleading partner. The second player carries a ball in their hands and looks by moving or other means to create or to find an opportunity to throw with their hands their ball at the first player's ball. If they hit it, the players switch roles. Dribble "with interference". Really nice activity from Geoff's Academy Practice. Players dribble in a box for 1-2 minutes with head's up. Next, players dribble in the box but should try to dribble between two other players and then to edge of box and then repeat. Next, players should dribble between two other players and then again through two other players, then to edge of box. Dribble across the box "with interference". See this soccer help video-- an always time-well-spent warm-up. 2. Inside, outside, laces kicking with wall. This is soccer (or football in some parts of the world)! Players must learn to kick the ball with both feet. Kick a ball against a wall 10, 50 or more times with different parts of our foot and you'll get more comfortable kicking and receiving the ball. It doesn't take much time, but you'll notice the difference if you practice it. Warm-up drill with many lessons to learn-- 1v1 tag. Setup 20 x 20 yard square as in image below. (No soccer balls are used.) 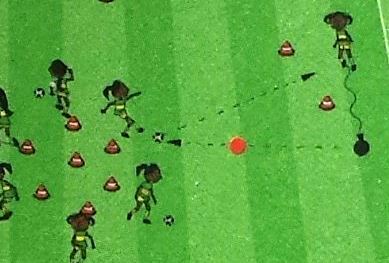 First player in line at top-right tries to run through cone "goal" at bottom-left. First player in line at bottom-left tries to tag them with their hand before they get through goal. Players switch lines after each turn. Video link 1 - simple drill and coaching points on how a defender can prevent an attacker from dribbling past to an endline. The goal for 1v1 defending is "9 out of 10 times or better" to not let a player get by with the ball-- disrupting them or forcing a mistake is the goal, not getting possession of the ball yourself. Outcome: players will improve at dribbling to the left or right past a defender in front of them. Play small-sided game (4v4 or more players), but require 3 passes before shooting. Accuracy is important. A warm-up drill is to balance a ball on a cone between two players on either side-- the goal is to knock the ball off the cone. Start both players at 10 yards from the ball. If that's too easy, move back to 15 or 20 yards. It's fine to start out kicking softly/carefully, but then challenge players to kick hard enough that a goalie would not stop it. Variation: have whole team partner up and practice, then run relay race to 3 balls knocked off cone-- sit down after you do it. Have a rematch(es) to let kids have another try. Simple and FUN Shooting & Goalie Drill - video link. Setup goals as shown in video. A line to right of each goal. Next player dribbles and shoots on goal, then becomes goalie for goal they started at as first player in other line dribbles down to shoot. See video. Geoff Anthony taught this at Academy practice. 1) Stress the importance of everyone being a striker in indoor soccer that is on the floor. Indicate that it is important to shoot at any opportunity when past the half mark and send your fastest strikers (2) in for the rebound. During this drill the Coach will say players name throughout the drill and the player whose name is called has two touches to kick the ball at the goaltender from wherever that player may be. The keeper then passes the ball back to the player and the player then continues dribbling with ball. I find this drill sharpens the players agility with the ball and also improves their reaction time. Not only this but it demonstrates that in indoor soccer you can shoot from almost anywhere past half and have a good opportunity to score. "Full field relay" - Purpose: practice moving ball quickly up field as team in series of passes away from our goal and towards opponents, head-to-head challenge adds urgency. Setup: place cones on X's as shown in image below (image on right is variation on pattern to try later). One player per cone, except two players at first/bottom cone. Make it competitive by having "mirror" set of cones on left-side of field so two groups will race against each other. On coaches signal, player at cone #1 passes or dribbles ball to player at cone #2 and follows ball by running to cone #2. The player at cone #2 receives ball and gets the ball to the player at cone #3 and runs to cone #3, and so on. The last player shoots goal and gets ball & dribbles to cone #1. Meanwhile, as soon as ball goes in net, the next player at cone #1 starts sequence over. Winner is first line to have original first player score a goal (i.e., so every player has been at each cone). Run drill again encouraging losing team to win this time. Offer tips to speed up. Try other patterns for cones, such as one below-right. 10. Pregame warmup activities -- It's important to get mentally ready. Here are some ideas for getting kids into the frame of mind for a game. 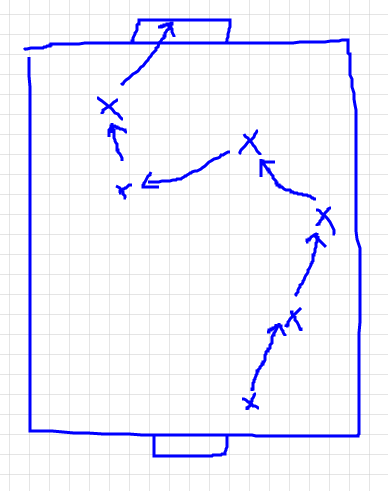 On signal switch directions with pull-back, cut, or some "move"
b) 1v1 Form two lines on either side of the goal. Coach lobs or rolls a ball out 20 yards or so & first two players try to score. First to ball is on office, second becomes defender. Play ends when ball goes in goal, out of bounds, or play extends to a minute or so. Clear out those players and start again for next two players. c) Form a circle with one player in the middle. One player on outside holds ball and tries to pass it to another player around the circle. Middle player tries to intercept the ball. If ball touches ground or middle player intercepts the ball then the last to touch it becomes middle player trying to get the ball. Many kids reach a level where they will begin to complain that the other team is pushing them and it's not fair. Some pushing is a foul, but soccer is a contact sport and kids need to be taught what is legal, what is a foul, and what to expect. a) Here's a video beginning to talk about "Strength on the ball"